Taxi rides, a very convenient solution for a number of routes, obviously come at a rather high price which many travelers may not be able to afford. 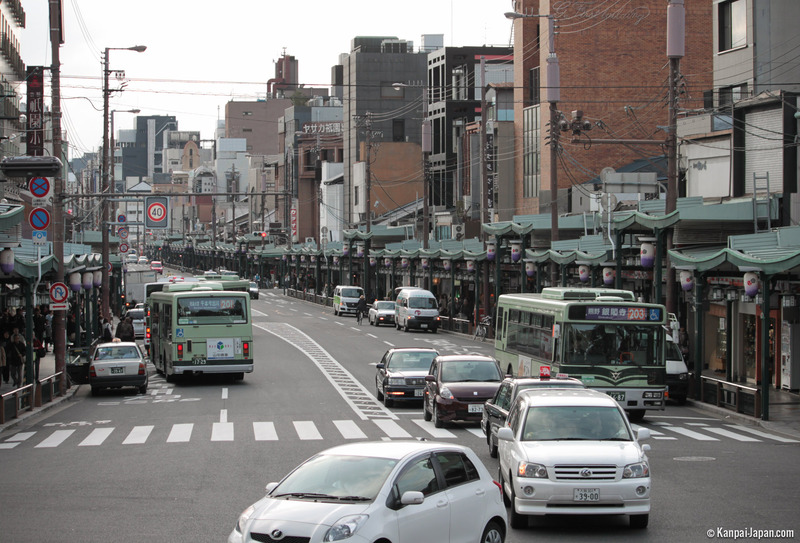 This is why, despite its drawbacks, the bus is the means of transport most used by the visitors of the former capital of Japan (and by its elderly inhabitants whose numbers reflect the population decline). Since it is not that easy to find one’s way around with buses, we have devised a guide for you to feel more relaxed about it. Click on the picture to display it full size. 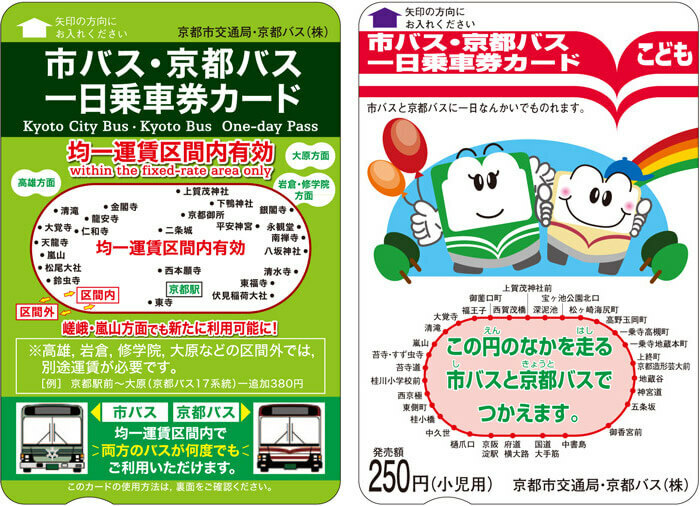 All municipal buses became compatible with IC cards (contactless, like the Suica card) in 2014. As often on Japanese buses, the seat-size does not fit the build of Westerners. Municipal buses are painted green. There are two different types which are described in detail below. Be careful though: As is often the case, the pass cannot be used over a 24-hour time span. It is only valid for a day, i.e. from morning through evening and even though you only start using it in the afternoon, it will not be valid any more the next morning. Their distinctive feature is the line number painted against a white background. The applicable rate depends on the number of stops. 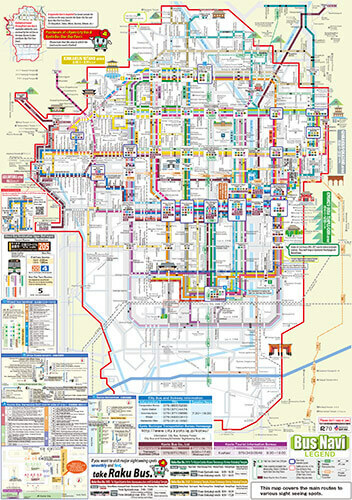 When you purchase this pass, you get a free map plus a range of discounts in some Kyoto stores. 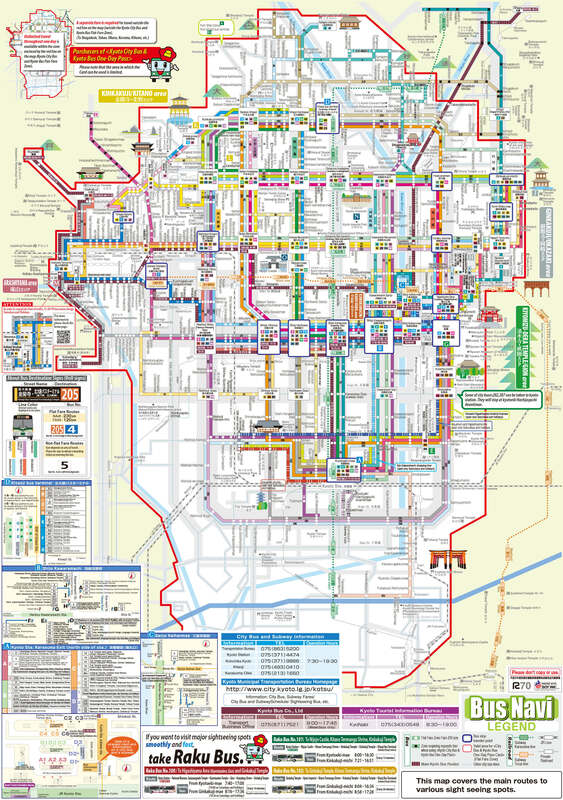 The good news for people who want to plan ahead or are unsure about how to find their way around is that there is a local version of Hyperdia, called Arukumachi, dedicated to the Kyoto transport network. On this website, you will find information about itineraries, schedules and rates and you can download the application on your smartphone. As is the custom everywhere in Japan, people start waiting in line at the bus stop and are always careful not to block the sidewalk. Boarding is through the rear door. The procedure may then vary depending on the type of bus. You do not have to buy a ticket upon boarding. Before your chosen stop, press one of the stop buttons to request the bus driver to stop. Just wait to buy your pass when you get off. Before your chosen stop, press one of the stop buttons to request the driver to stop. Just like in most buses around the world, the name of the next stop is displayed on a screen in the front part of the vehicle, often spelled out in Japanese and sometimes translated into English. Situated to the left of the driver (who is at the front of the vehicle on the right hand side), this machine is intended to handle most passenger-related procedures. Stamp your pass when using it for the first time (you will only be required to present it to the driver after that). The simplest way is obviously to use an IC card. If you forget your Tokyo Suica card for example, it will be worth purchasing an Icoca or Pitapa card (the local Kansai cards). Given the difficulty that may arise from carrying any (especially bulky) luggage around when riding the buses in Kyoto, we strongly recommend you to use the excellent Takkyubin delivery system or simply hire a taxi when you have heavy luggage in tow. Karasuma / K (Turquoise and vertical) north bound to the Kyoto International Conference Center at Kokusaikaikan and south to Takeda, via the Kyoto JR station. Tozai / T (red and horizontal, or nearly…), west bound to Uzumasa Tenjingawa and south-east to Rokujizo. They cross paths at Karasuma Oike in the city center. 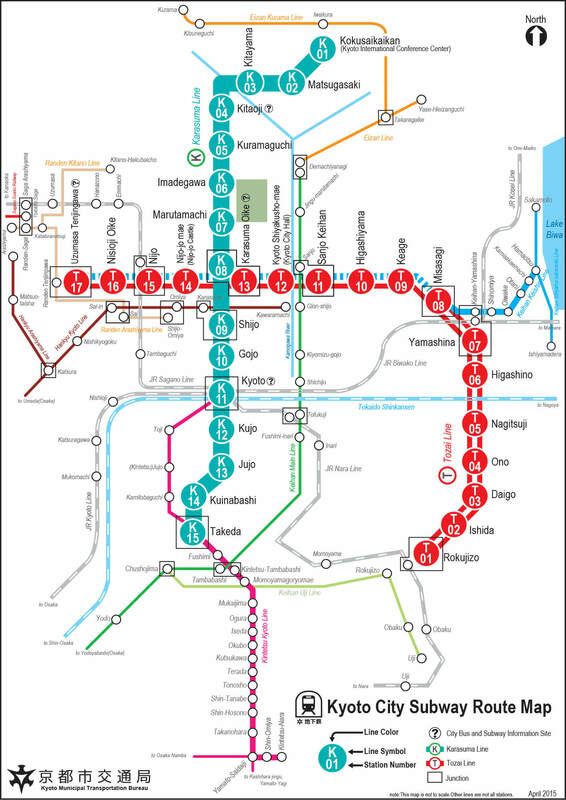 It is also worth mentioning that the Arakumachi application also exists for the subway. Please visit this address to download it.